At CCL Label, our Wine Group is committed to excellence in printing and service for all of our customers whether large or small. 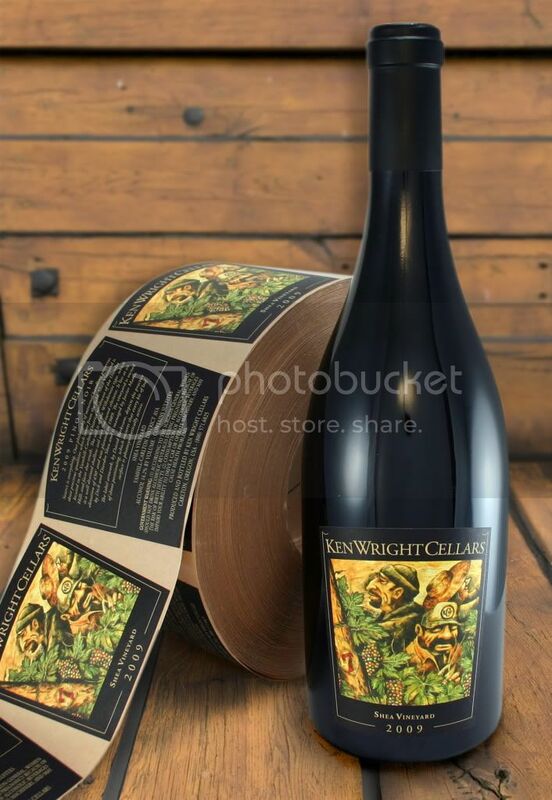 Wine labels are unique in their need for quality decorations and attention to detail no matter the size of the run. We pride ourselves on being partners with our customers and work together to bring the right blend to each label. With facilities in Australia, the USA and South Africa, we are poised to deliver beautiful labels anywhere in the world. Let us help you create, enhance and refine your labels. Utilizing multiple production technologies, CCL Label can produce print runs large and small, cost effectively and timely. Whether printing on conventional UV offset and UV flexo presses, or with the latest digital offset technology, you will be delivered labels of the highest quality. Each print run is reviewed and assessed to see which press best suits your label and run size. Be assured that no matter which press your label is printed on, you will have access to the highest quality and extensive decorations. Using one or any combination of these finishes are options available with CCL Label. BELUGA GROUP, a leading company for alcoholic beverages in Russia, and supplier CCL Kontur present the design of a new product under the Myagkov brand: the first vodka made of organic spirit. The joint team of BELUGA GROUP and Rosspirtprom JSC has been working on this project for over 2 years. They carefully selected wheat farms, determined a spirits production facility nearby a source of pure natural water – all to create a recipe that would allow consumers to discover a new taste of vodka made from organic ingredients. Myagkov Organic is produced of specially selected wheat grown in the fields of Russian farms under the conditions where natural characteristics of soils are preserved and only organic fertilizers have been used during certain periods. After several successful projects together, BELUGA GROUP has chosen CCL Kontur again as supplier for the launch of Myagkov Organic. CCL has proven to be a reliable partner and is well-known for bringing packaging innovations and developments to the Russian market. The supplied label highlights the naturalness of the product and was printed using flexo technology. Thanks to the matt varnish used, its surface has a fibrous haptic that resembles that of kraft paper. The green leave, a symbol for the organic, is printed using screen tactile varnish and has integrated fresnel lenses that are in line with Myagkov’s flagship products – Silver and Classic vodka. The pictograms on the backside of the label are printed with the use of sculptured relief embossing that ensures strong brand protection and hinders counterfeiting. CL is the pioneer of Pressure Sensitive Labels (PSL) that can be washed off in common industrial bottle washers. The globally recognized independent committee of the 36th International Wine Challenge awarded a gold medal to Château de Pommard’s latest vintage of Clos Marey-Monge Monopole. Throughout the rigorous judging processes, each medal-winning wine is tasted on three separate occasions by at least 12 different judges. Owner of Château de Pommard, Michael Baum was highly involved in creating the ideal decoration. With a clear vision and the attempt at absolute excellence in each detail, he and Appartement 103 went for a complete re-stage of the brand to modernize the brand. CCL Label was chosen to bring the new decoration to life. Trials were run at CCL Moussy, France, to find the right substrate with the best embossing result in combination with the white. In the end embossing and custom-colored foil were combined for a stunning appearance. Visit www.chateaudepommard.com to find out more. Pernod Ricard choose CCL Label as supplier for Café de Paris. Pernod Ricard has decided to move their sparkling wine brand Café de Paris to PSL decoration. The newly outfitted bottles are available since September and will definitely attract attention! The elegant oval label with its golden elements and fine matt background underlines the product quality. Japan has superior quality standards and being one of the main markets for Café de Paris, the demand for both product and packaging is high. Moving from wet-glue paper labels to PSL offers dimension and lends a whole new aesthetic to the bottle. Thanks to the half transparent areas as well as matt and shiny contrasts decoration and container become a harmonious entity. To manage a cost effective but impressing decoration Pernod Ricard chose CCL Label as supplier. With their ASD technology, combining conventional printing techniques with digital in the most flexible way, they offered the ideal solution for this packaging challenge. In total there are 28 variants of labels to be printed for Café de Paris. There are nearly 30 variants for the 75 and 25 cl bottles – including different fruit images and languages. The variable elements are all printed in inkjet, the constant elements are realized with conventional techniques. What makes ASD superior to an all-digital printing process is the combination of advantages from different techniques to create the most satisfying result: with digital printing alone the opacity of the white could not have been achieved. Only in combination of both – conventional and digital – could these variable designs be printed with high-end quality. The labels were printed at CCL Castleford – one out of six locations worldwide with ASD capabilities. A Witch a Dragon & Me is not a group of fairy tale authors but a group of friends pursuing a dream. The four wanted to create their own premium spirits – and so they did. To create something out of the ordinary they started from the traditional and combined it with their own ideas. The Muscatel Gin is the perfect example: While maintaining the traditional juniper taste, it is refined with muscatel wine and orange peel. It might seem an unusual choice at first, but the infusion makes the Muscatel Gin a creation with personality and regional connection, as it originates from one of the wine areas of Germany. A Witch a Dragon & Me - Handcrafted Premium Spirits. Another A Witch a Dragon & Me-creation is a premium vodka “without hocus-pocus”. It was named after janitor Harald Schatz who was (and still is) a central figure, inspiration and constant help for the young company. To find the fitting decoration reflecting the quality and identity A Witch a Dragon & Me turned to CCL Label. The printing plant in Trittenheim is specialized in wine and spirits labels and offers expertise on self-adhesive paper labels, premium substrates, embellishments and digital printing. The labels for A Witch a Dragon & Me are made with strongly structured uncoated paper, which is often difficult to print on digitally. Nevertheless, thanks to CCL’s technical expertise and special adjustments the labels could be created both cost and time effectively. Besides their carefully selected substrates the labels underline the premium quality of the products due to embellishments such as embossing and high-build gloss varnish. Additionally, variable data printing allows numeration indicating year, batch and bottle number to make each product more personal. To create a whisky is an art form in itself. To regularly come up with limited editions and special blends entwined with a story and the right packaging that tells it to the customers is the master class. The whiskymakers at Compass Box have perfected this art. With support from long-term supplier CCL Label they demonstrate their creativity and skill on a regular basis. The recent launches Phenomenology and the mysterious No Name whisky are impressive evidence. Whisky is a drink enjoyed with all senses. Therefore Phenomenology is a fitting name: it describes the philosophical study of experience and consciousness. Compass Box No Name and Phenomenology in detailThe perception of a whisky can be different for each person – there is no right or wrong. Normally a description of taste can be found on the back labels but for Phenomenology Compass Box leaves us in the dark. Whoever is exploring the taste of the whisky is encouraged to find his/her own definition. The surreal art of the front label was combined with a selection of embellishments for an extraordinary high-quality appearance. Matt varnish gives the decoration a soft look and lets the foil and high-build gloss elements stand out. The embossing gives dimension to the beautifully designed graphics. Compass Box’ second new launch doesn’t even need a name to impress. The blackness of the decoration promises a mystic experience. The dark paper substrate is graced with symbols surrounding whisky making and witchcraft – emerging from the background only through the high-build varnish and its glossiness. In the middle of the front label golden foil and debossing inform us that this whisky has indeed no name. 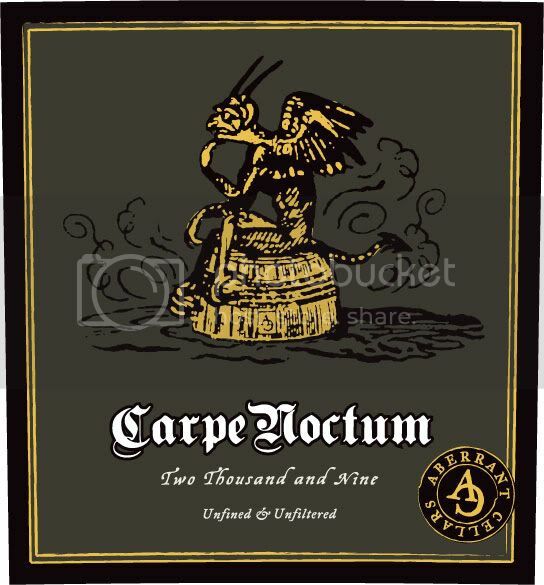 According to the whiskymakers at Compass Box this creation speaks for itself. The smokiness and peaty taste give it an exceptional complexity and intensity. Being a blend from different malt whiskies it combines peaty and smoky flavours with a rich sweetness from French oak and a fine fruit character – the ingredients for a bewitching creation as promised by the label. CCL Kontur’s subdivision for Shrink Sleeves in Podolsk has produced the decoration for a special New Year edition of Myagkov Vodka. The project is another example of the on-going successful cooperation of the BELUGA GROUP and CCL Kontur. Trendy design, innovative materials and latest technologies combined with excellent printing quality and fine Swarovski elements will surely attract additional attention to the product. Almost like a second skin Shrink Sleeves from CCL offer 360° decoration ensuring perfect application to the exact shape and size of the bottle. Intense white ink in combination with bright red and the metallic blue background of the promotional decoration make for a festive brilliance. To top it all off Swarovski elements were applied to the sleeves after printing with perfect accuracy. A type of decoration that is ideal for premium products, special events and limited editions! An especially designed filling level indication completes the promotional decoration. The sleeve comes in combination with a self-adhesive two-ply neck label with matt and tactile varnishes. The two-ply construction is perfect for expanded content information. They contain recipes for delicious winter cocktails and an invitation to share more on social media. If you like unwrapping presents you’ll love the latest limited edition of Absolut! In time for the holidays The Absolut Company has launched a special edition of their signature vodka brand to offer consumers an extraordinary experience! The limited edition is dressed from head to toe in elegant blue with a metallic effect, shimmering in the light. High lustre silver accents complete the outfit. But a beautiful outside is not all the 360° decoration has in store! The highlight is a feature that is nearly invisible but has a huge impact: The sleeve is outfitted with a set of perforations, enabling the consumer to unwrap the bottle in a unique opening ritual. Underneath a special limited edition of the iconic Absolut bottle awaits. “The interactive design of Absolut Uncover reflects the excitement that begins once you uncover the hidden possibilities of your night through something unexpected. This holiday season we would like to inspire you to shine with a bottle that can be the perfect gift to any party or celebration as it can be unwrapped like a present”, says Gaia Gilardini, Global Communications Director for Absolut. The supplier of the sleeves, CCL Label, worked closely with Absolut and their design company to maximise the efficiency of the design printing. To guarantee easy application and perfect fit, CCL designed uniquely shaped perforations for each of the three bottle sizes. A special high-shrink PET film was used to allow for the covering of the cap. The Absolut Uncover limited edition will feature approximately 2.8 million bottles, which are distributed worldwide. Learn more about perforation here. Today Siam Winery is Thailand’s leading producer and distributor of wine and innovative lifestyle beverages. Over 15 years ago when the winery was founded it was still uncommon to produce wine outside of the typical regions between 30th and 50th latitude. It didn’t take long before Siam Winery proved to the world that it is indeed possible to craft great wines in Thailand – at 13th latitude of the northern hemisphere! In 2003 Siam Winery found the quality of the grapes was especially good in the Hua Hin area, which is why the flagship vineyard “Monsoon Valley Vineyard” is located there today. Monsoon Valley is Siam Winery’s iconic range – it is served in restaurants all around the world. To effectively promote and differentiate their products on the market the decoration played an essential role. All in all there are three ranges of wine – classic, premium and flagship. Together with CCL Label, Siam Winery created fitting decorations for each of them. The labels of the premium wines for example feature a key character of Thai culture called “Naga”. The silhouette of the serpent-like creature is graced by golden hot foil making it stand out from the background. In combination with the carefully chosen colours and high-quality paper it makes a fitting premium decoration that perfectly underlines character and origin of the wines. The self-adhesive labels are produced at CCL Label’s Bangkok plant. The local team understands the customer’s needs and works passionately to meet them time and again. Siam Winery and CCL Label can already look back on a successful business partnership of almost six years. The winemakers at José Maria da Fonseca had an exceptional idea for their Lancers wines. To bring summer onto the shelves they challenged the students of IADE – the most important design university in Portugal – to create a special design. Over 150 students submitted their ideas and ultimately the fresh Pop Art design was declared as the winner. It convinced the winemakers because it best reflects the Lancers DNA. Additionally the design met the requirements regarding feasibility and adaptation to the market. The cool and shiny silver of the sleeve underlines the freshness and makes the bottle a real eye-catcher. With the red and green Pop Art dots and cartoon elements it turns into a truly unique decoration – compelling from every angle. Just as the wine itself the design combines history and modern spirit. First produced when World War II ended, Lancers became a hit in the US and is still today associated with joy, celebration and wellbeing. Today Lancers is one of the bestselling Portuguese wines worldwide. The summer edition is available in the US, Mexico and China as well as most European countries. CCL Labels Shrink Sleeves are a popular decoration solution for limited editions offering maximum space for design, promotions and messages for the consumer – one of many reasons José Maria da Fonseca chose CCL as their supplier. After their spectacular “Love Wins” edition last year Diageo launched another limited range of sleeved bottles promoting love and equality. This time the message is a reminder – or even a call – to “Choose Love”. To help spread the message Smirnoff teamed-up with their partners at Design Bridge and CCL Label to create a promotion that will once again turn heads! The six different designs were created by brand design agency Design Bridge who took inspiration from illustrator Rob Bailey’s ‘Hey Man’. All of them show couples in love – regardless of gender and skin colour. “We were delighted when Rob agreed to collaborate with us on this project, and we set about working on the design together. After deciding upon a series of 6 bottles – one in each colour of the Pride flag – we worked closely with Rob to create 6 new sets of embracing couples to adorn each of our Choose Love limited edition bottles”, the agency states on their blog. To transfer the results of this creative process onto the bottles CCL Label King’s Lynn in the UK produced the full body sleeves using state-of-the-art gravure printing. The vivid rainbow colours in combination with the matt lacquer give them not only an outstanding look but also a nice surface feel. As an additional feature for interaction the sleeve design includes a snapchat code. After scanning it will unlock a dedicated filter. To find out about last years edition click here. This June Roust Group will launch a limited edition of Russian Standard vodka in the US and Canada. The famous vodka brand is very popular in North America. To regularly charm both regular and potential buyers, the US-American Roust unit keeps delivering beautiful limited editions to the market. The upcoming launch is the second in a series of Fabergé inspired limited editions. They not only spark the desire to collect the unique bottles but also help Roust achieve their core mission, which is “to continue delivering authentic products and experiences to [the] consumer base”, says Giulio Bertozzi, VP Marketing for Roust USA. The inspiration behind this series of limited editions is the work of the Fabergé family – especially Peter Carl Fabergé – who is best known for the Imperial Easter Eggs made from precious metals and gemstones. The luxurious appearance that has fascinated tsars will now cast its spell on everyone coming across one of these Russian Standard bottles. The full-body decoration allows the complex design to span the whole bottle, giving it a 360° high-quality appearance. The Shrink Sleeves were printed in rotogravure and finished with lacquer to visualise the brilliance of the metal and gems. Roust authorised long-term supplier CCL to produce the Fabergé inspired sleeves. They were printed at CCL King’s Lynn in the UK. There are brands everyone knows. And some have become so familiar that we recognise them immediately, no matter where in this world we encounter them. There are brands everyone knows. And some have become so familiar that we recognise them immediately, no matter where in this world we encounter them. Whether it is through a certain colour combination, style of lettering, shape or even a simple melody – these brands are fixed in our memories, consciously or subconsciously. But what made them so prominent? All these successful brands have one thing in common: a strong visual identity. For finished goods industries like the beverage business it becomes clear that packaging is an essential component of presenting this identity to the consumer. Being the only medium apart from the product itself coming into direct contact with the consumer, the packaging plays a crucial role in carrying the brand identity out into the world. To make sure their products are memorable and distinctive brand owners have to keep inspiring their consumers – developing the brand without alienating their loyal buyers. CCL Label not only offers first class decorations – but also the knowledge and experience to help push brands forward. We actively support our customers with a passion for new technologies and innovations, as well as limitless printing capabilities. Many long-term customers have successfully boosted their brand image with the help of CCL. Over the past years, quite a few brands have been through design changes that have always strived to create a more contemporary look. Ever since switching to PSL by CCL – one-way or WashOff – they not only modernised their brand identity, they also saw increases of sales! Clearly visual identity is a decisive factor for the success of a brand. Shrink Sleeves visualize the values of the contents of a bottle – class, power, freshness or innovation. Unconventional bottle shapes grab consumer attention, communicate the brand positioning and trigger additional purchase. Shrink sleeves fit perfectly - no matter how unusual the container form is. They guarantee maximum shelf stand out and lend your product a certain brilliance that catches the eye. The sleeves are resistant during filling as well as versatile, fitting even the most difficult shapes. Perfect distortion is guaranteed, even with challenging designs. Graphic brilliance combined with outstanding embellishments complete these unique decorations. Our digital offset presses offer the next generation of sustainable printing. With none of the film, plate and ink requirements of traditional presses, we can print your labels in a shorter amount of time and with less waste. We treat our digital presses with the same respect as our traditional offset presses and you will be impressed by the level of excellence we can offer. With digital offset printing, you are not penalized for multiple varietals since there are no plates or inks to change. Through the use of six-color process technology, we can match almost any spot-color with no sacrifice in quality. The addition of a white ink station also lets us print on clear and metalized substrates. With digital presses on all continents, we can now offer you the same foil, emboss, screen and die-cutting solutions that were previously only available on traditional offset and flexo presses. When every label needs to be consistent to the wine that it accompanies, your brands are sure to stand out. Toronto, December 3, 2014 – CCL Industries Inc. (“CCL”), a world leader in specialty label and packaging solutions for global corporations, small businesses and consumers, announced today that it has acquired Druckerei Nilles GmbH and its related subsidiaries (“Nilles”), a private company located in the heart of the German wine producing region on the River Mosel. In addition to its wine label business, Nilles enables European customers in many other end-use markets to purchase custom designed labels online using proprietary e-commerce software, more than 500 domain names and digital printing. Nilles’ 2014 sales are estimated to be approximately $15.7 million with an adjusted EBITDA of $2.7 million. The transaction enterprise valuation is $17.3 million in cash, assumed debt, pension liabilities and deferred equity compensation. CCL Industries now employs approximately 10,300 people and operates 98 production facilities in 28 countries on five continents with corporate offices in Toronto, Canada, and Framingham, Massachusetts. CCL Label is the world’s largest converter of pressure sensitive and extruded film materials for a wide range of decorative, instructional and functional applications for large global customers in the consumer packaging, healthcare, automotive and consumer durables markets. Extruded and laminated plastic tubes, folded instructional leaflets, precision printed and die cut metal components with LED displays and other complementary products and services are sold in parallel to specific end-use markets. Avery is the world’s largest supplier of labels, specialty converted media and software solutions to enable short run digital printing in businesses and homes alongside complementary office products sold through distributors and mass market retailers. CCL Container is a leading producer of impact extruded aluminum aerosol cans and bottles for consumer packaged goods customers in the United States, Canada and Mexico. 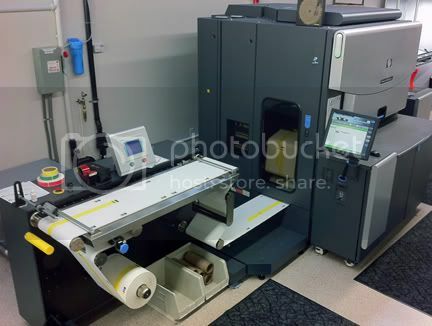 Withdigital offset printing, you are not penalized for multiple varietals since there are no plates or inks to change. Through the use of six-color process technology, we can match almost any spot-color with no sacrifice in quality. The addition of a white ink station also lets us print on clear and metalized substrates. The world’s leading vintner’s choose CCL’s offset printing capabilities vintage after vintage. When every label needs to be consistent to the wine that it accompanies, your brands are sure to stand out. CCL Wine-Card...a wine pourer integrated right into your label! 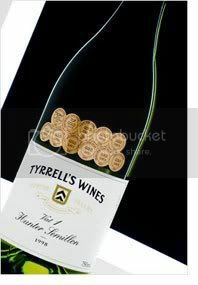 The CCL Wine-Card cleverly adds beneficial value to a well established product. Besides the decorative element it contains a perfectly functional wine pourer that strengthens your brand and triggers sales. CCL's Wine-Card is directly integrated into the label of your wine and functions as your brand’s business card as well as an instant wine pourer. This free but stylish add-on generates real added value for your customers. • Wine pourer is integrated into label and separated from the bottle by a state-of-the-art zipper system. 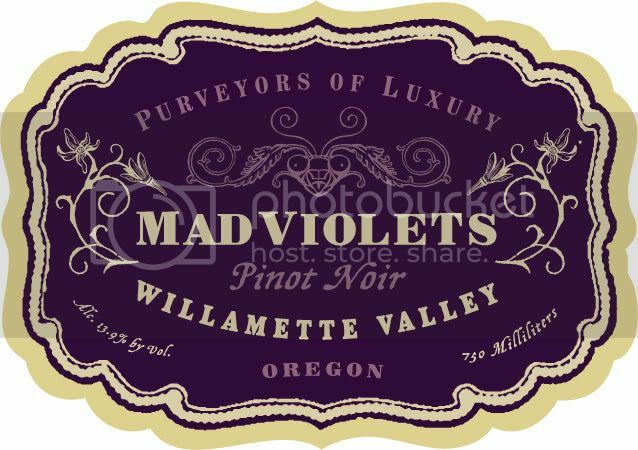 • There are no limits in regards to design; original wine label remains on bottle after Wine-Card is removed. • Wine-Card complies with food safety regulations and is certified by renowned institutes. • Fully automated application is available. Soundpaper embeds audio, animations, URLs, coupons and other media directly into a 2 Dimensional barcode. Unlike earlier generation barcodes such as QR Code, Soundpaper contains the actual media so no web connection is needed. Audio is played nearly instantaneously and HTML 5 content (such as animation) is displayed whether there is a cell phone connection or not. In addition to these instant features, Soundpaper also has the ability to provide web delivered content (as QR Code does), if desired, at the same time. Soundpaper may be used to add novelty to product labeling or as an effective way to communicate instructions or warnings (for instance, in pharmaceutical packaging). Soundpaper may be printed on a wide variety of presses and paper in a variety of shapes and sizes and colors. With variable printing, Soundpaper may include different messages or other content within each impression. Soundpaper may be printed on nearly any type of label or substrate. Also, Soundpaper can be recorded in any language. Soundpaper may be printed in your choice of rectangular form factors. The amount of audio is dependent on the size of the Soundpaper strip and the density of the printing. The two Soundpaper strips shown below each encode 10 seconds of audio. 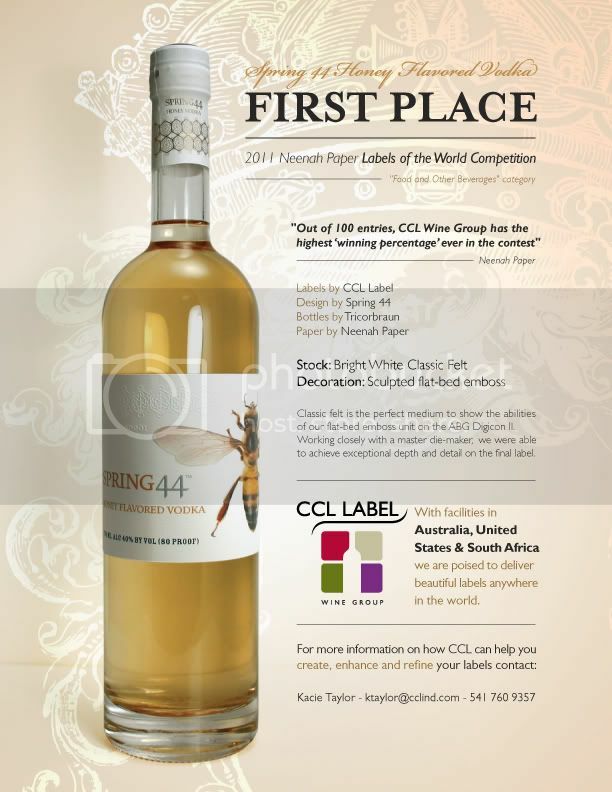 Spring 44 Label Wins 1st Place! Create | Enhance | Refine. 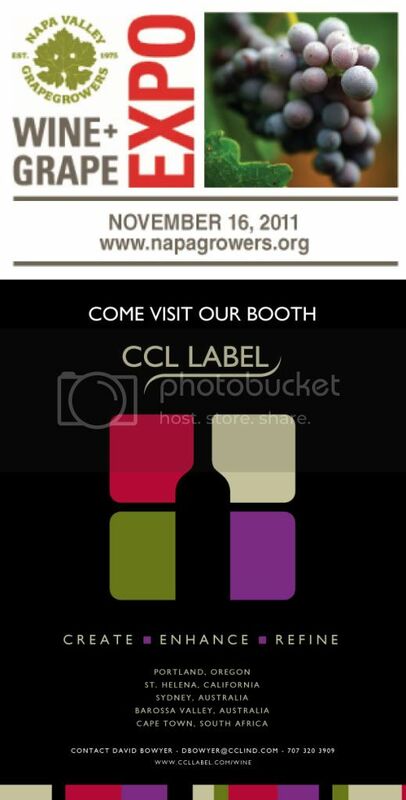 Come visit our booth at the Napa Valley Grapegrowers Wine+Grape EXPO on Wednesday, November 16. We'd love to see you there! 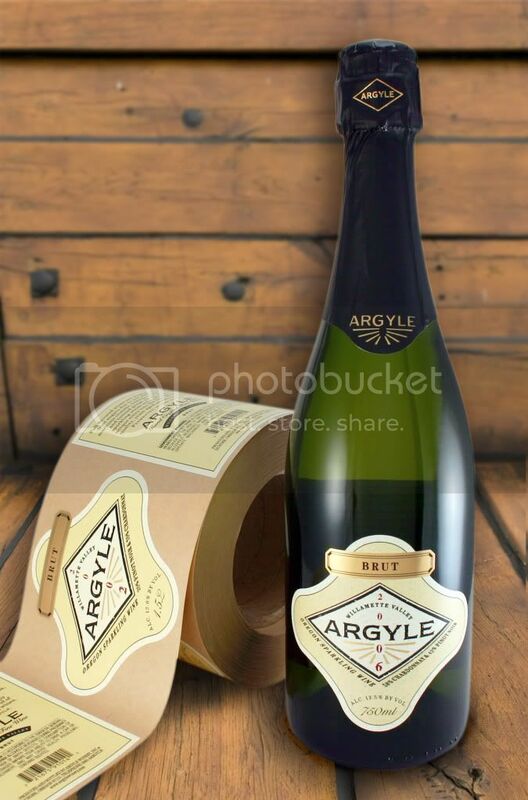 If you have won a medal or trophy for your wine and wish to decorate the bottle & advertise its quality, Clear Image Labels can help you with the right type, size, shape and color. Each year Clear Image produces millions of medals & trophies that adorn wine bottles in Australia and around the world; they are the silent salesperson touting the virtue of your wine, often commanding a higher price for the bottle and certainly differentiating it from others. Download the following document to assist you in determining what is available & how to order medals. Large or small, new or established, each of our customers is considered to be a unique and valuable asset to the CCL family. Our customers span the globe and with that comes many diverse and exciting labeling challenges. CCL not only accepts these challenges but revels at the opportunity to bring innovative and aesthetic solutions to the table. Our customers are considered partners, and to our partners we say thanks! With custom finishing units in our US and Australian facilities, we can now offer you the same foil, emboss, screen and die-cutting solutions that were previously only available on traditional offset and flexo presses.